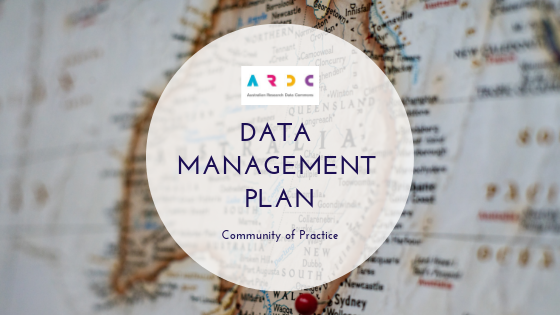 This Data Management Plans (DMP) Community of Practice is targeted at people in Australia and the wider Oceania region who are interested in discussing, building and improving data management plans (DMPs) best practice and technical tools. Liz Stokes from the Australian Research Data Commons (ARDC) will initially co-ordinate the group. The first meeting for 2019 is on Tuesday, 9 Apr 2019, 14:00 - 15:00 AEST. 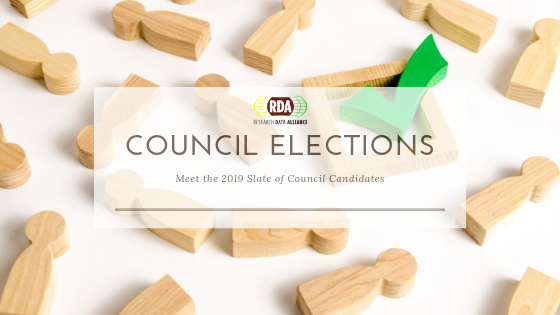 The RDA Nominations Committee presented a slate of candidates for three open Council positions. RDA Council elections will open on 2 April during the RDA Plenary 13. 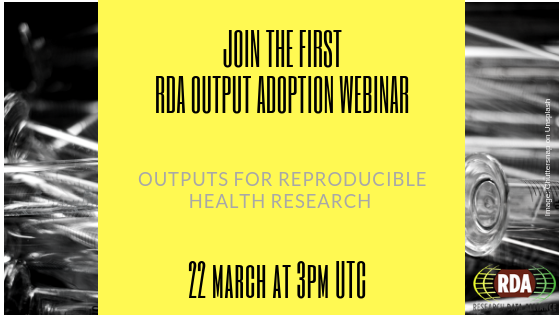 First RDA Output Adoption Webinar - Reproducible Health Research. 22 March. The RDA Working and Interest groups work hard to develop outputs that provide technical and social solutions to solve data sharing challenges globally. These outputs are of great value to a wide range of organisations and individuals that deal with research data. Not all stakeholders are aware of these valuable assets that the RDA community has to offer freely. A task force has been set-up to support the RDA community in promoting the uptake of its outputs globally and cross-domain. This recently formed Global RDA Adoption Team aims to widely promote the uptake of RDA outputs among stakeholders in all its regions and domains through training, improving the visibility of outputs, the sharing of adoption stories and stakeholder engagement at RDA plenary meetings. One line of action this team is working on is a series of webinars that aim to train stakeholders for adoption. The webinars will highlight outputs for adoption, ask adopters to tell their story and show the added value of RDA. 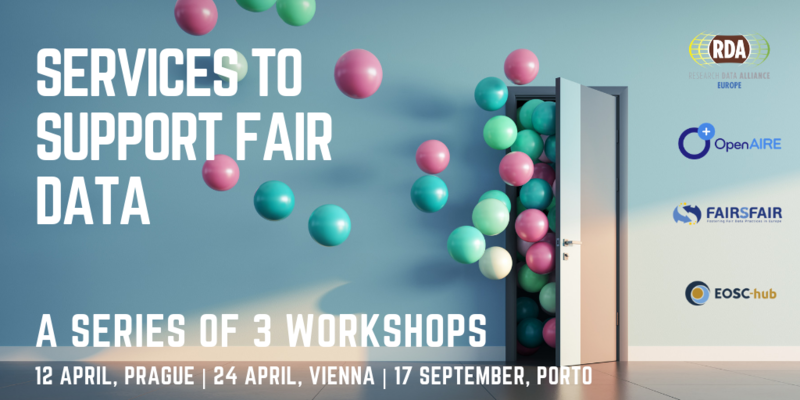 OpenAIRE, RDA Europe, FAIRsFAIR and EOSC-hub are happy to announce a series of three workshops, two in April and one in September, called ‘Services to Support FAIR Data’. The purpose of this workshop series is to explore how existing infrastructures can work together and understand how to deliver services that support the creation of FAIR research outputs. First RDA Unconference/Do-a-thon at P13! 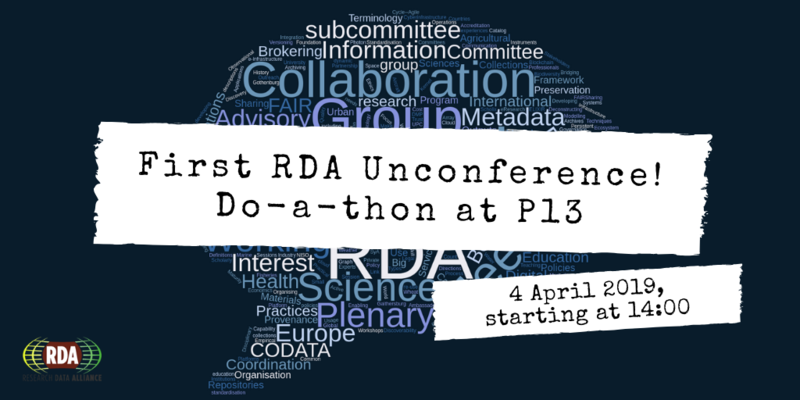 In response to the ongoing conversations about our potential to do more and be more effective as "researchers and innovators openly share data across technologies, disciplines, and countries to address the grand challenges of society", we are trial-running the first RDA unconference at P13. The Group will have its first face-to-face meeting during RDA Plenary 13 in Philadelphia. The session will aim to reach consensus on the key principles and phases of the design methodology that will lead to the definition of the common set of core assessment criteria for FAIRness. The group is also organising two webinars on February 21 and February 22 to discuss the scope of the work and look at an overview of existing approaches. 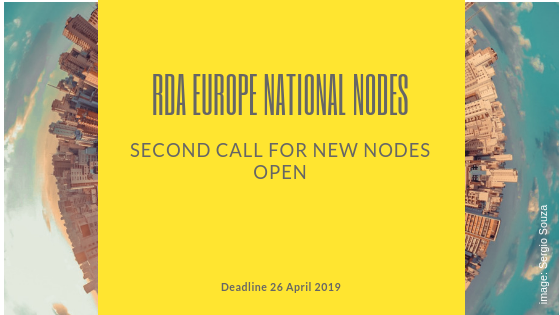 RDA Europe National Nodes: Second Call For New Nodes Open! RDA Europe, the European plug-in to the Research Data Alliance, is expanding its network of thirteen national nodes to foster adoption of RDA outputs in the region. Agricultural sciences, Engineering, Earth Sciences or High energy physics, these are just a set of the domains that have Ambassadors appointed under the umbrella of the recently launched RDA Europe Ambassadors programme. 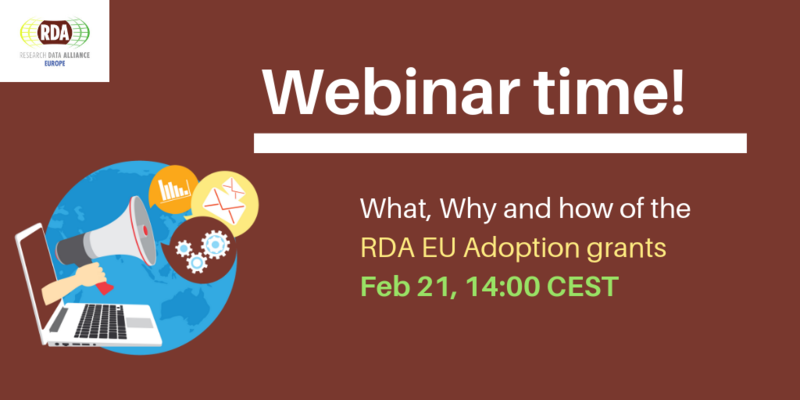 On February 21 at 2.00 PM CET, RDA Europe 4.0 organises a Q&A webinar to give a detailed overview of Adoption Grants programmes and the application process for the grants, evaluation criteria while aiming to answer questions from the participants.